← DNS Manager For WHMCS 2.2.0 – A Quantum Leap In Web Hosting Business Management! We are overflowed with pure satisfaction to let you know that our offer will soon be expanded by a brand-new product that will easily find its application in every company regardless of its size and nature - Discount Center For WHMCS! There is no secret behind the fact that employing occasional promotion tactics pays off enormously as it translates into an increased bottom line as well as a new audience. Discounts have proven brilliantly effective at boosting sales in all manner of business sectors. It is in view of these outstanding merits that we have created Discount Center For WHMCS! This highly practical module will open up the possibility for your clients to pay less upon ordering specific combinations of your products and services. What is more, you will be able to define discounts dependent on the number of products in the cart as well as enable discounts for selected client groups only. Discount Center For WHMCS is scheduled for official release on March 9th 2nd but you can already have dibs on it thanks to the presale! Order the module before the release date and pay 30% less for the best way to entice new clients to come to your business and retain current ones! 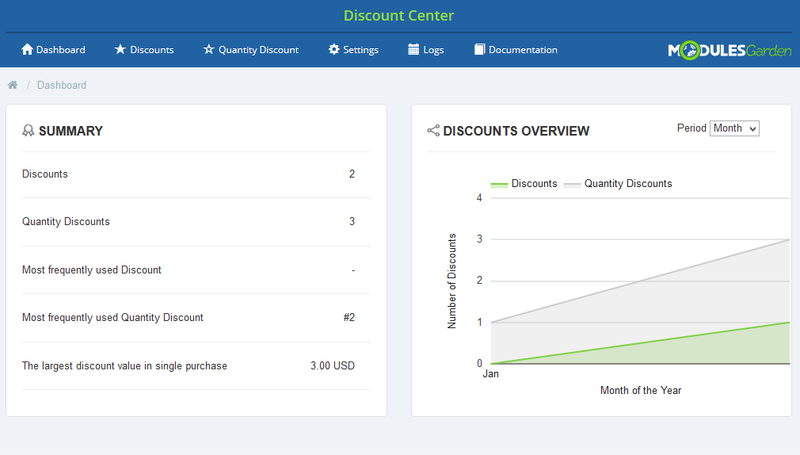 In its initial version, Discount Center For WHMCS does not provide such ability but this is an excellent suggestion and we will certainly put it into practice in future updates. If there is any other kind of promotion strategy you would like to pursue with the help of our module, be sure to let us know about it. We are fully open to your thoughts and ideas! This is really a must have option! Also it would be great if we could define on multiyear abo, the first year with a discount price. We can also imagine an impact on the product itself for existing customer. Let’s imagine a campaign that target customer telleing them for the next 3 months you can subscribe for free to several additional options and then, after the period, theese options are automatically charged to customers that didn’t unsubscribed. We very much agree with you – these features will unlock great potential within the products offering strategy. You may expect them in the next updates of the module! Another feature that is probably worth adding is “Scheduled Holidays’ Discounts” where you can set certain “dates” where discounts/promotions kick in automatically. Something like Black Friday, Cyber Monday etc… The calendar in the module would “Save the date” and activate the promotion on select products during the “Holiday Season”. That is a truly marvelous idea! This feature will most certainly find a broad application on numerous occasions. You may rest assured that it will join the range of features in one of coming updates. Thanks, Ahmed! You’re more than welcome! I am glad that the MG Team found my idea to be feature-worthy! I personally cannot wait for it to be added because we are in need of such feature and I’m happy to contact the dev-team with more details if needed. By all means! We warmly invite you to open a ticket and discuss all your ideas with our specialist. The voice of our customers is the mainspring of modules’ development! Discount Center For WHMCS will be released a week earlier than initially planned! NOTE: Yes I know this can be done using Promotional Codes with WHMCS now. But I want to get away from the hassle of having to use a promotional code. The system should see that the clients has one product of xyz hosting package so that will entitle them to a better price automatically. I have a non hosting site using WHMCS that could use this scheme as well. People away’s forget to use the Promotional Code, they then stop the order process until I tell them to use the Promotional Code. The above example would be so helpful. Thank you for sharing your point of view and explaining the needs of your business – this is of huge importance for us to see further development of Discount Center For WHMCS in wide perspective. The module will not contain the feature you have described in version 1.0 but we will do our best to introduce such possibility in future updates. My question is re Quantity Discount: I assume that I can configure to have say 10% discount if you buy 2 items, and 15% if you buy 3 items etc. But I only want this to apply per order. If a registered customer already purchased 2 items last month, and now buys another one, he/she should not get a discount this time. Will the module work that way or can I configure it to work like that? Thanks! 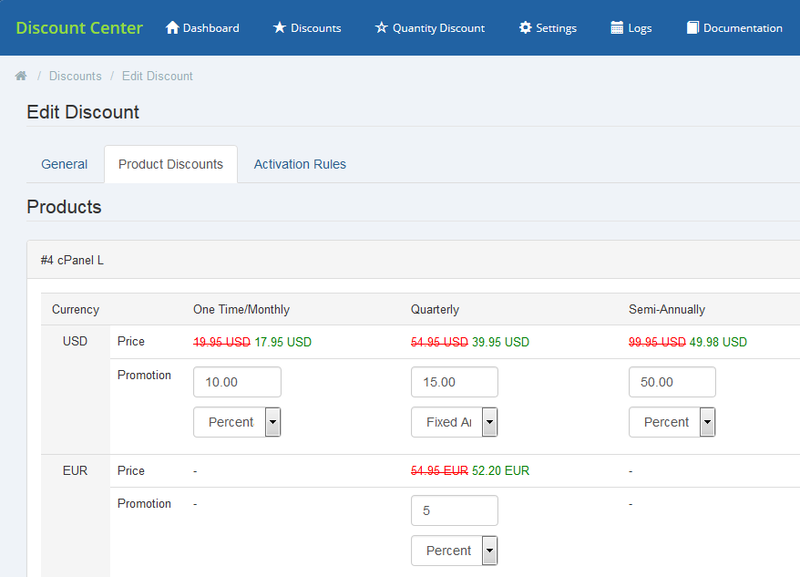 Discount Center For WHMCS works exactly the way you wish, i.e. Quantity Discount is applied only if specified in discount rule number of required products is purchased in a single order. I am also waiting for Fredric mentioned feature like First month some different pricing plans. Hope you guys will soon get it done in upcoming release. Overall the plugin looks very good. is this work with whmcs 7? The module is currently under modernization and should be ready within the next few days. Several ways to trace the progress on that matter have been described in the Blog article ‘Let The WHMCS V7 Frenzy Begin!’.